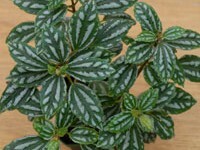 Upright growing, foliage plant, with small green leaves, variegated with silver stripes and spots. Branches easily, making a small, shrub-like companion plant to your violets in no time at all. Great for windowsill or Lightstand! Prefers bright light, but no direct sun. Attractive!